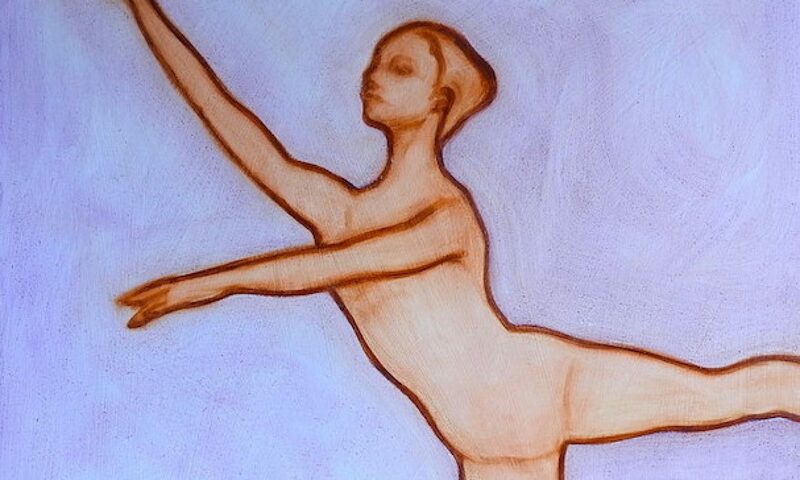 This is another painting of a dancer I finished recently. I am combining my love of glazing with drawing, here starting to draw the line with the brush in a bistre. This has a translucency I like. Then I glaze over in thin layers of paint in the same way I would paint my portraits. Glazing really has an unrivalled luminosity! I’m not sure where these are heading but I was pleased with the more liquid effect in the paint and I think this is something I will be exploring further. I have painted some other ones but mixed the colours to start with, but these don’t seem to have the quality of translucency like this painting. I think I like to strip an activity down to its absolute essentials; here the original drawing is done in a single translucent colour, and then 3 other colours were used in the later glazing. There is no modelling apart from the drawing, and really its nothing more than a line. In a 3rd arabesque the dancer stands on their right leg, with their left leg extended behind. The right arm is extended forwards at roughly eye height, and the left arm is extended parallel to it at shoulder height.